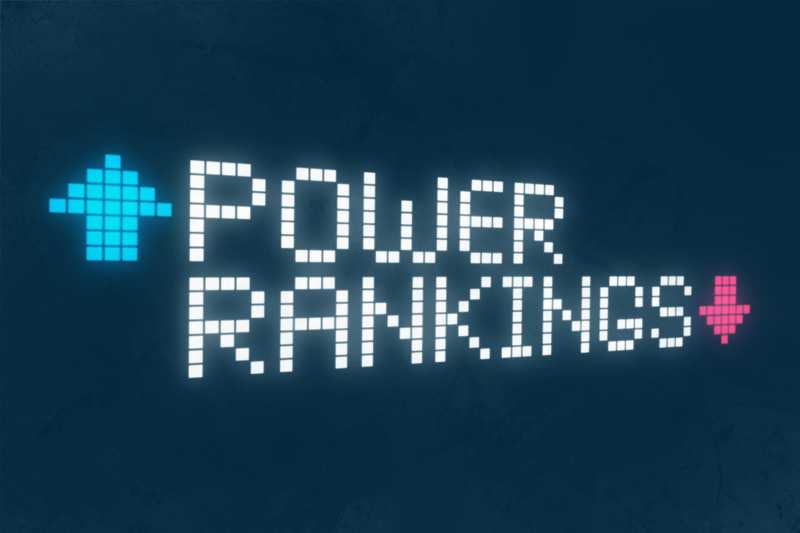 Power Rankings: Week 9 - The Point Data-driven hockey storytelling that gets right to the point. A week after getting Auston Matthews back from injury, the Leafs got William Nylander back this week. Even though they lost his first game back against Detroit, he adds another weapon to the third-highest scoring team in the league. You can read more about what he brings to the team here. That’s good enough for the Super Computer to award them the top spot in the rankings. The Lightning has won five straight despite still missing starting goalie Andrei Vasilevskiy. Brayden Point and Nikita Kucherov have been on a tear since they’ve been paired up and Point is now tied for the league-lead in goals. They’ve now won back the trust of the Super Computer after falling down to 7th last week. If you’re thinking, how is this team not number one?. Five straight wins, 1st place overall. Well, send all hate mail to supercomputer@gmail.com/notarealemail. 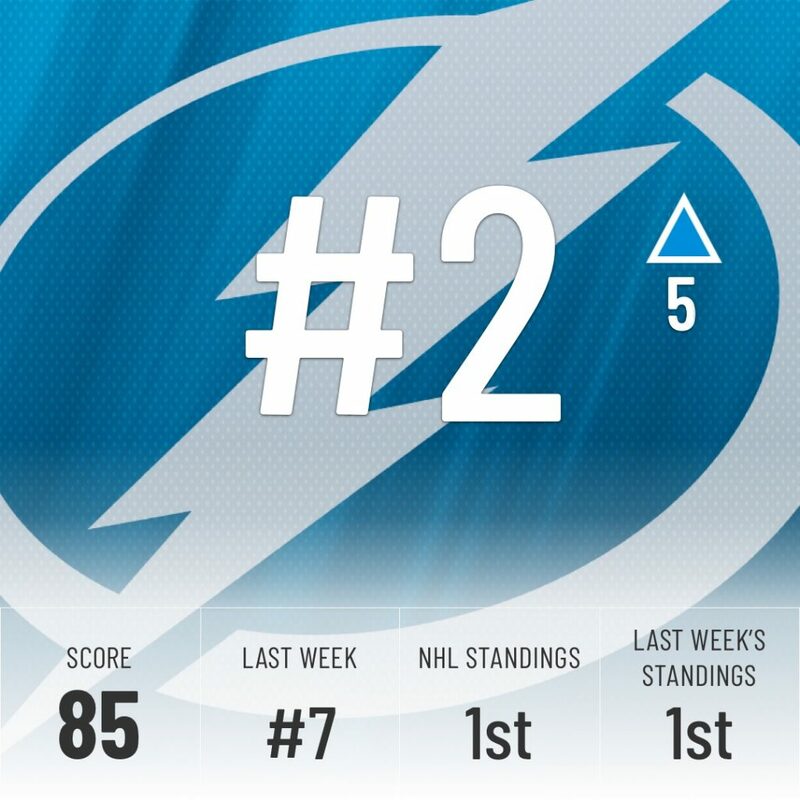 The Leafs and Lightning square-off Thursday in Tampa – I guess we’ll see who’s boss then. Another team on a win streak, the Flames have won four straight, including a 9-6 goal-fest against the Blue Jackets, on the road for good measure. They lead the league with 4 players who have already crossed the 30-point mark in Johnny Gaudreau (37), Sean Monahan (33), Matthew Tkachuk (32), and Elias Lindholm (32), with Mark Giordano on the cusp with 29 points. 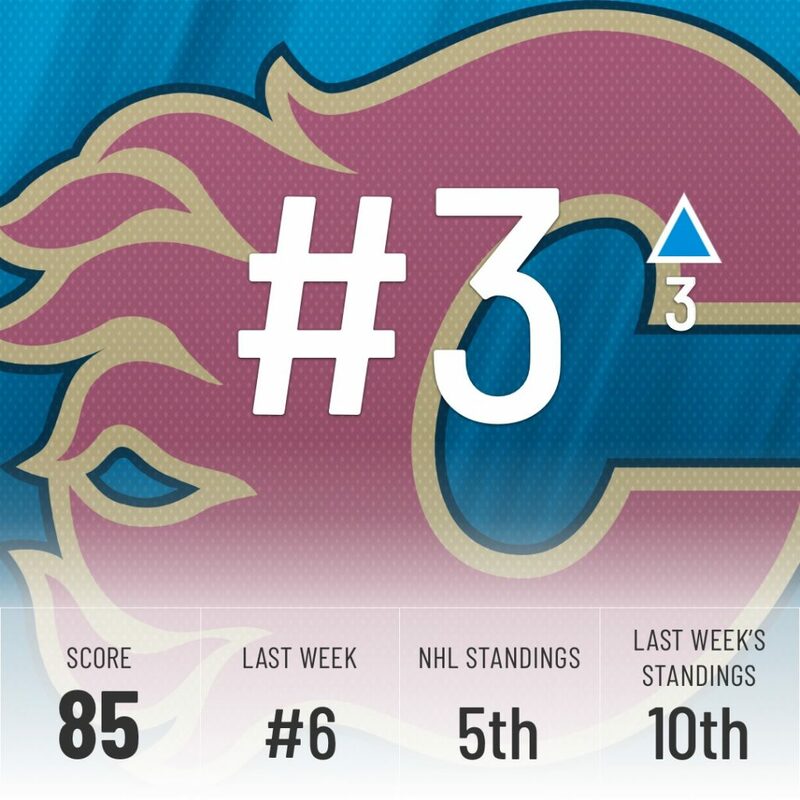 Expect Calgary to keep climbing up the standings. Well, that didn’t last long. After topping last week’s power rankings, they had a mediocre 2-2-0 week and fall to 4th in our rankings, right in line with their league standing. Saturday’s game against the league-leading Lightning will be a key indicator of where this team really stands. 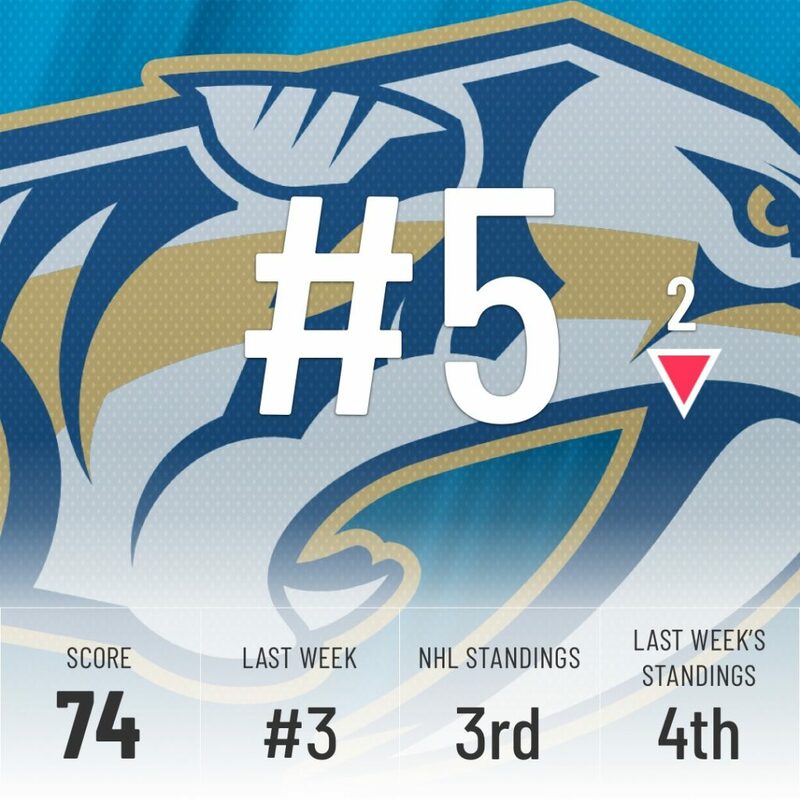 Early season performances aren’t enough to keep the Preds in the top 3 anymore according to the Super Computer. A loss to the Canucks will look bad on any contender’s resume and they have now dropped four of the last seven games. Nashville seriously needs to right the ship soon or they will keep falling further down our rankings and the standings. To stay in the top 5 you need to do more than just squeak by weak competition, you need to beat them convincingly, something the Jets haven’t done this week. Even though they ride a four-game win streak, three games against bottom-10 teams in our rankings were decided by only a goal. That’s not enough to impress the Super Computer and they fall down one spot this week. The Golden Knights are back! After a nine-place jump last week, they move up another seven spots this week to crack the top ten for the first time since the start of our Power Rankings. Their hot streak has coincided with Nate Schmidt’s return from suspension, something you can read more about here. 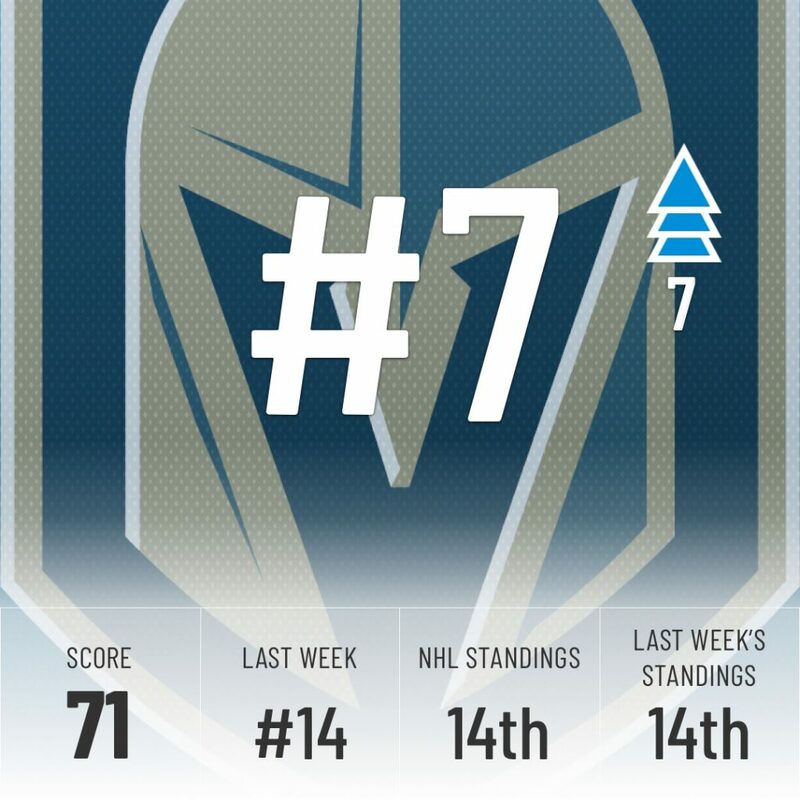 With what looks like a week of soft matchups coming up, Vegas should keep rising in the standings. Expect them to be in a top-3 spot in the Pacific this time next week. 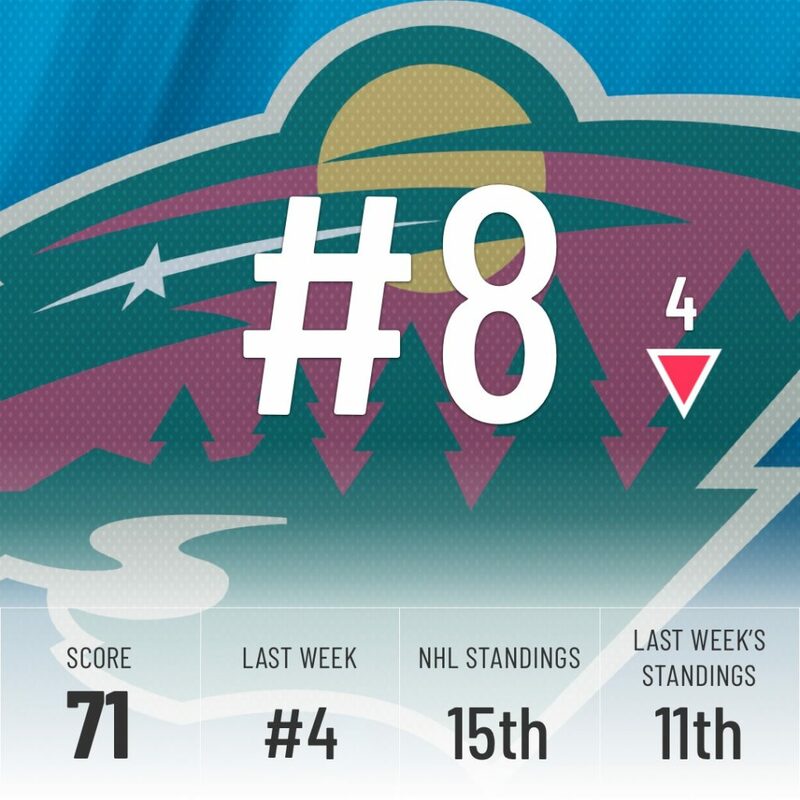 Tough week for Minnesota, as they lose two games against top-3 teams in our rankings. They’ve now lost 4 of the last 5 games, with their only win coming against the lowly Canucks. The Super Computer still believes in them though, even if they fell to 15th in the standings, but they will need to string wins together next week if they hope to hold on to their place in the top 10. It was disappointing for Sharks fans to see their team lose Erik Karlsson’s first game against his former team, but the Sharks bounced back well and limited their next two opponents to just one goal each. They climb one spot, but it has more to do with teams around them falling down the rankings. Washington’s win streak came to an end this week, with losses to the red-hot Ducks and Golden Knights. They have a quiet seven days coming up with only two games, neither one against a top-10 team in our rankings. They will have to win out to hold on to the top-10 themselves. The Shea Weber effect is in full force in Montreal! Three wins in four games this week, all by a 5-2 score, grants them a 7-place jump by the Super Computer. 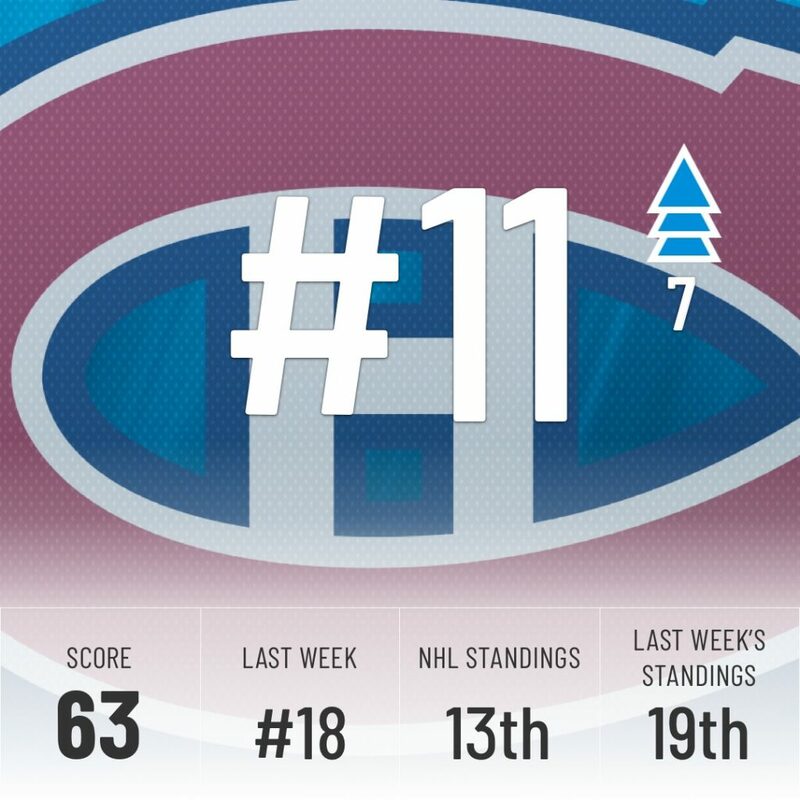 Since their captain returned to the ice, the Habs own a goal differential of +6, higher than their season-long mark of +1. His return indeed could not have come at a better time. Two games, two wins for Dallas this week. Even with John Klingberg still sidelined, the Stars have won their last four in a row. Next week will say a lot about this team, as they face the Sharks twice and the Golden Knights. 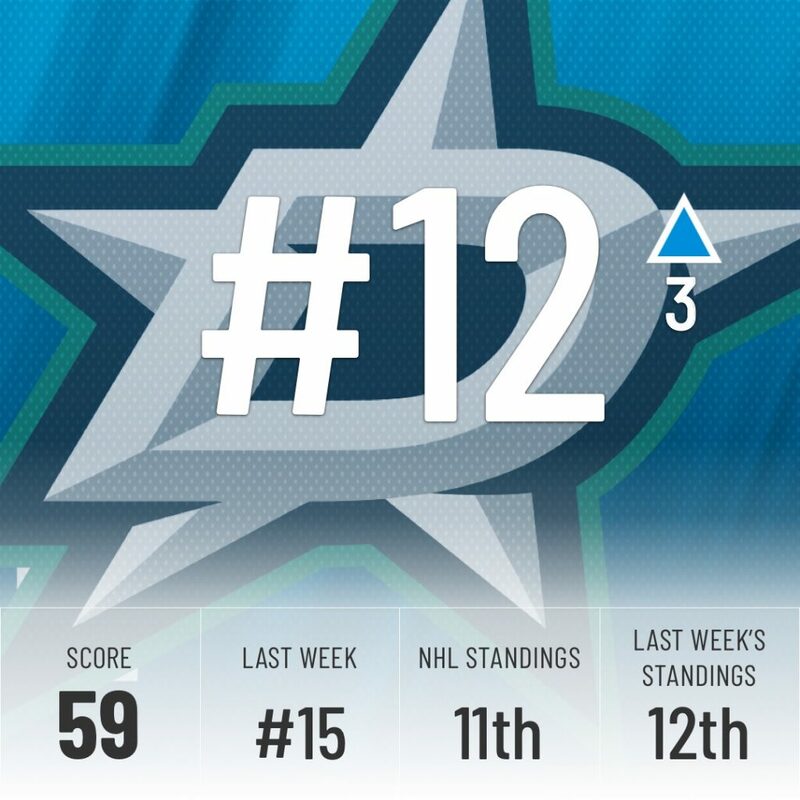 A strong showing might convince the Super Computer that the Stars are worthy of a top-10 spot. 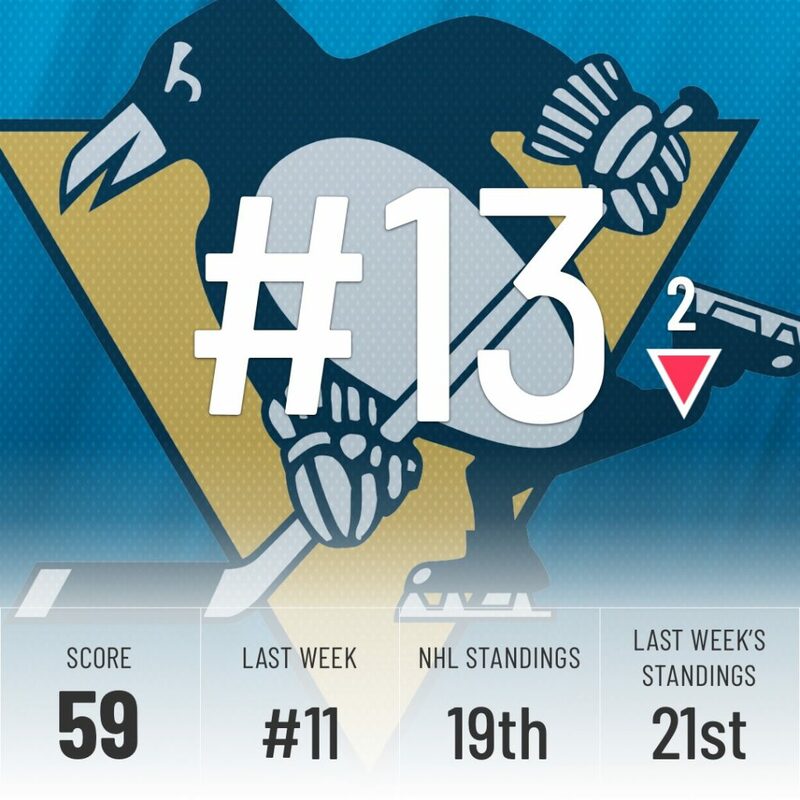 The Super Computer knocked the Penguins down a couple of spots despite taking down last week’s #1 team, but it still believes the Pens are better than their place in the standings indicates. This is still a massive turnaround for a team that was near the bottom of the league a short while back. We weren’t doubting them earlier in the year but either way, everyone should know better than to doubt Sid the Kid by now, especially when he call pull off goals like this. Kid’s still got it. 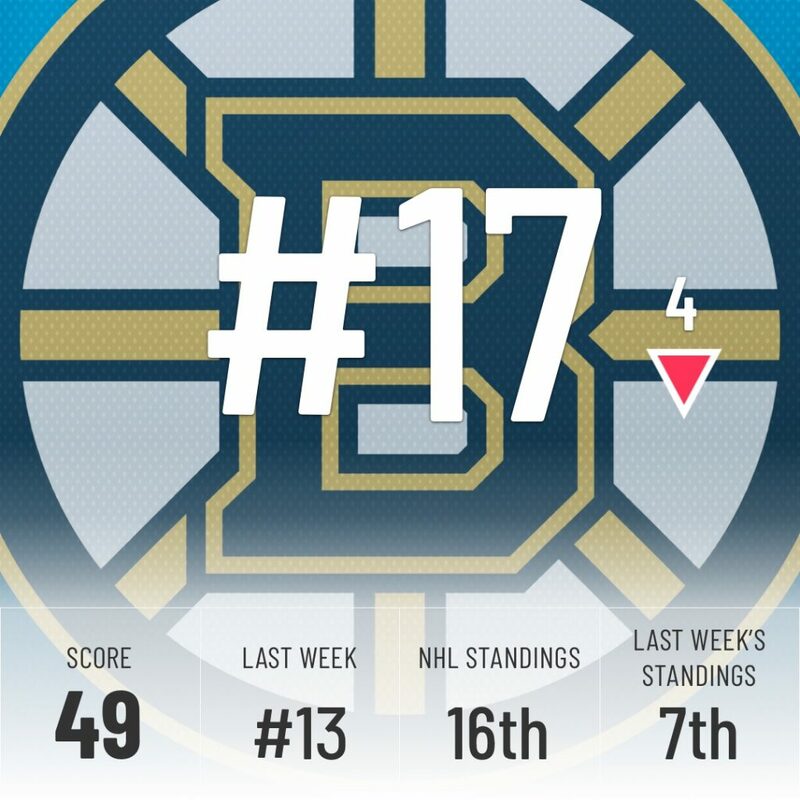 Giving up nine goals in a game is never a good way to move up in the rankings and, surprise surprise, the Super Computer has moved the Jackets down a couple of spots this week. 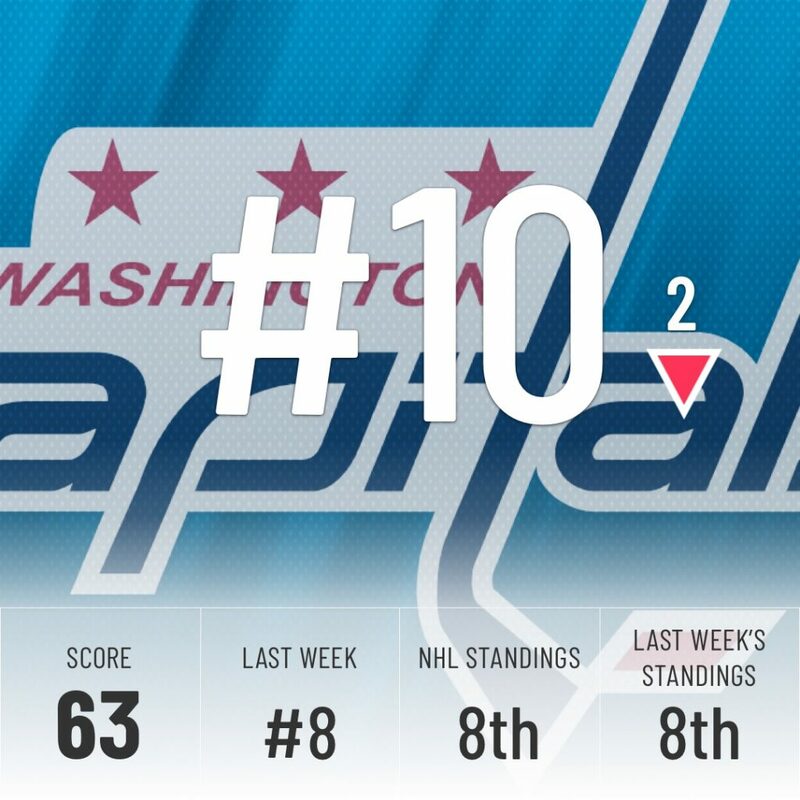 The Capitals already took over as the division leaders and the Pittsburgh Penguins are heating up. Columbus has to be looking over its shoulder. 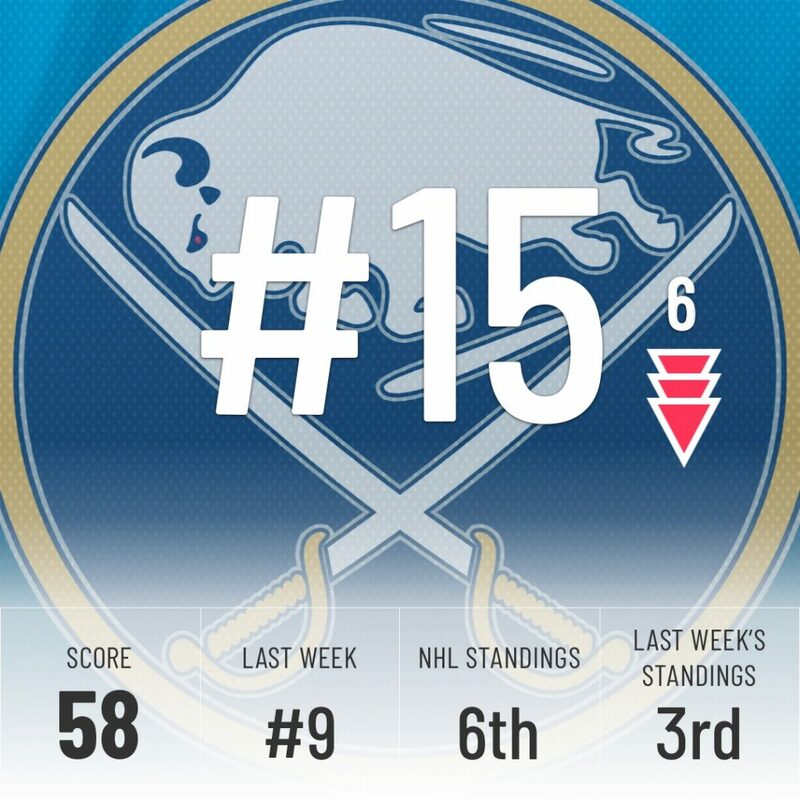 Even after a 10-game win streak, the Super Computer barely had the Sabres in the top 10. Their flaws were too glaring despite the wins. 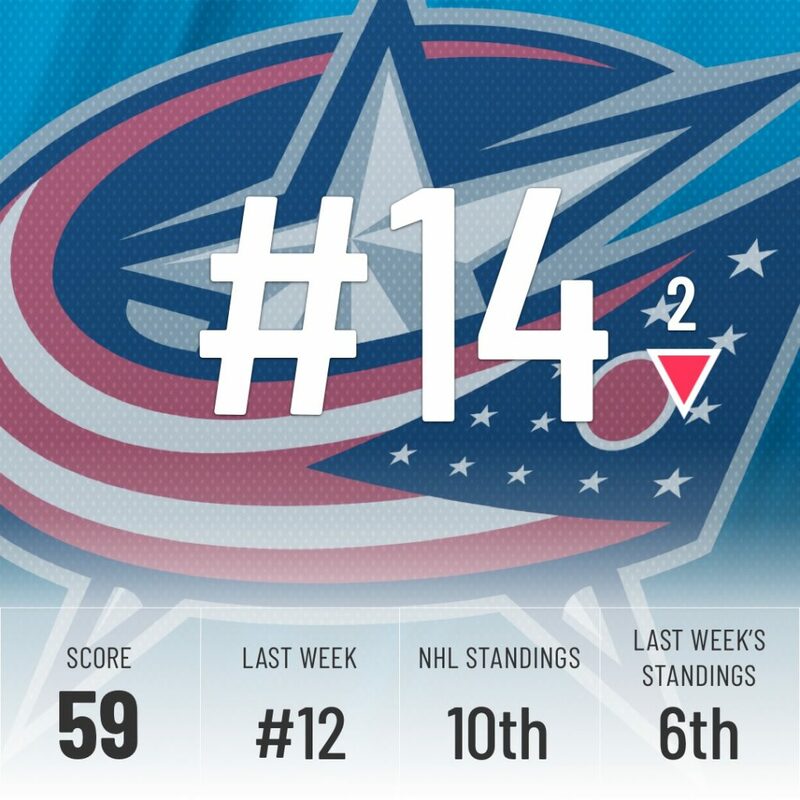 Well, now the Sabres have fallen back to earth with four straight losses and the Super Computer expects them to fall even further, ranking them way lower than their 6th place in the NHL standings. 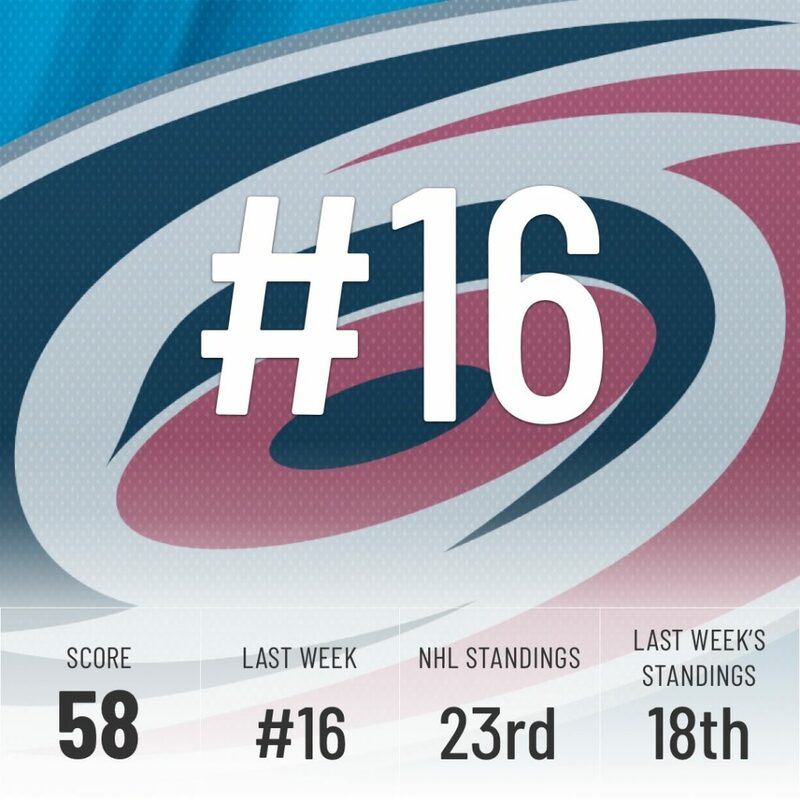 The Hurricanes get a pass from the Super Computer after a 0-2-1 week, including a loss to the bottom-of-the-standings Kings. 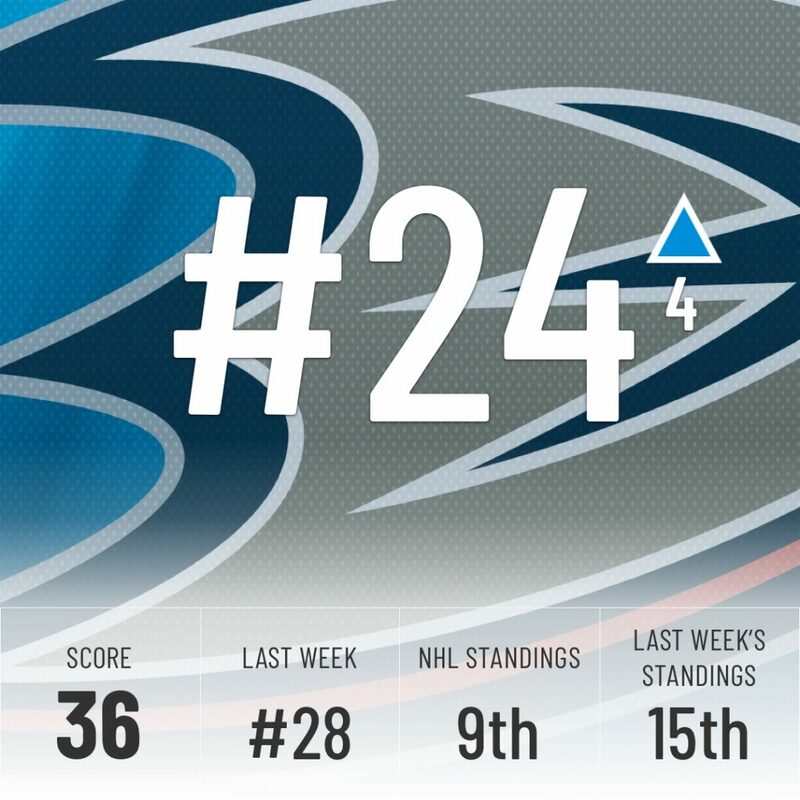 They’ll need to step it up to avoid falling next week, with games against the red-hot Ducks and the Maple Leafs. Boston has been heading nowhere fast since Patrice Bergeron went down with an injury. They’ve scored over two goals only once in nine games without their top center. 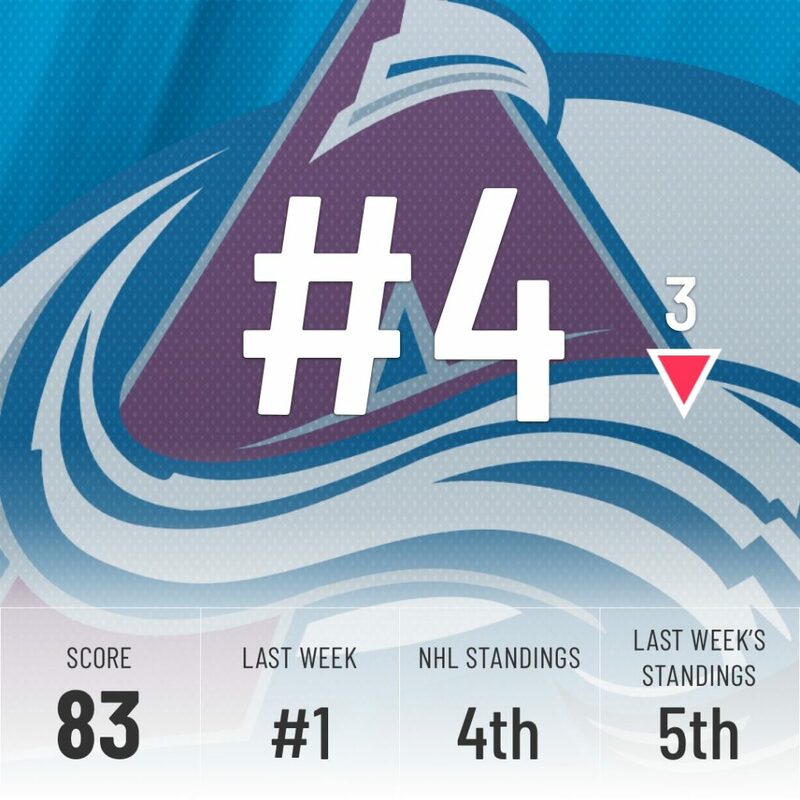 They’ve still managed to go 4-4-1 since, but their lack of offense doesn’t impress the Super Computer, as they fall four spots. Once again, it’s hard to judge this team properly, as they’ve spent most of the year dealing with key injuries in their lineup. 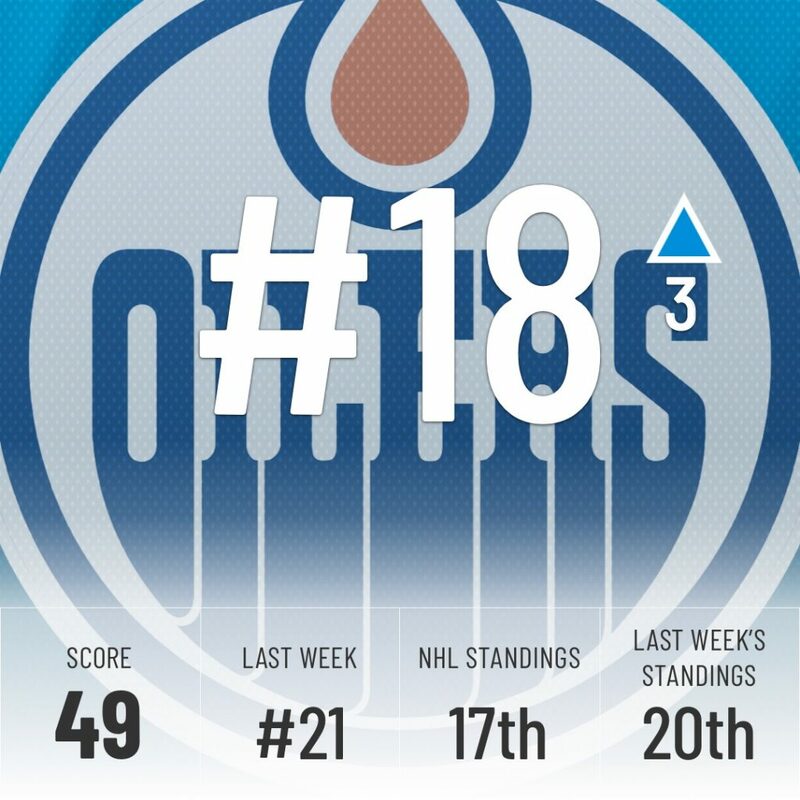 Connor McDavid did something this week that no player has done since he has entered the league. In other words, it’s business as usual in Edmonton. Oh, and he scored this beauty in a shootout win against the Blues. Florida received a boost this week when Roberto Luongo came back from injury (again) and posted a big shutout against the Bruins. Goaltending’s been an issue for them this week and the Panthers posted another .500 week. 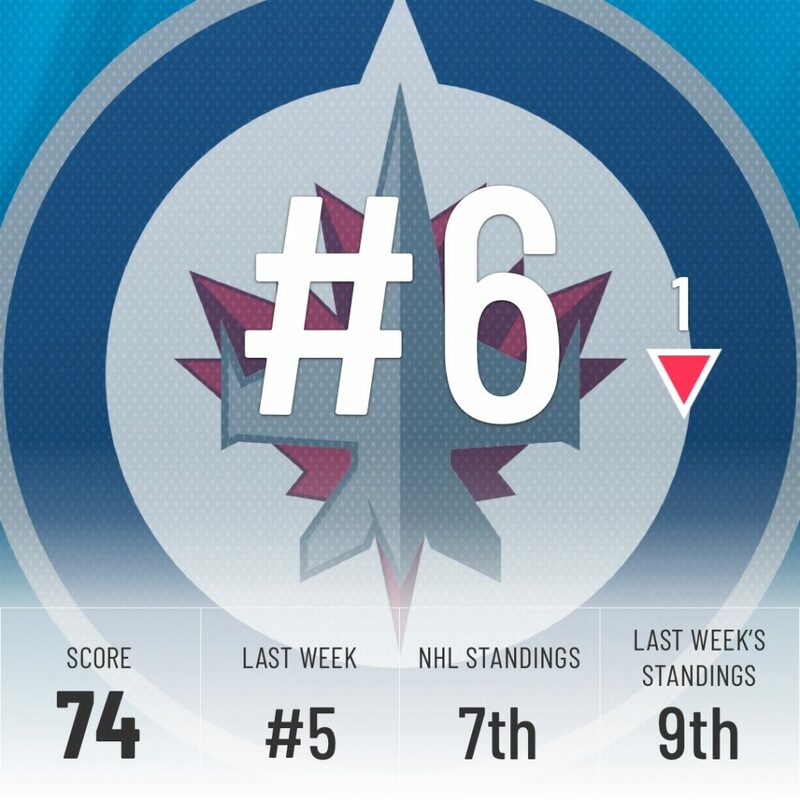 They moved up in the rankings and the Super Computer agreed with the move but if they want to be a playoff team they need to start stringing together a few more wins. The Super Computer is growing a conscience! 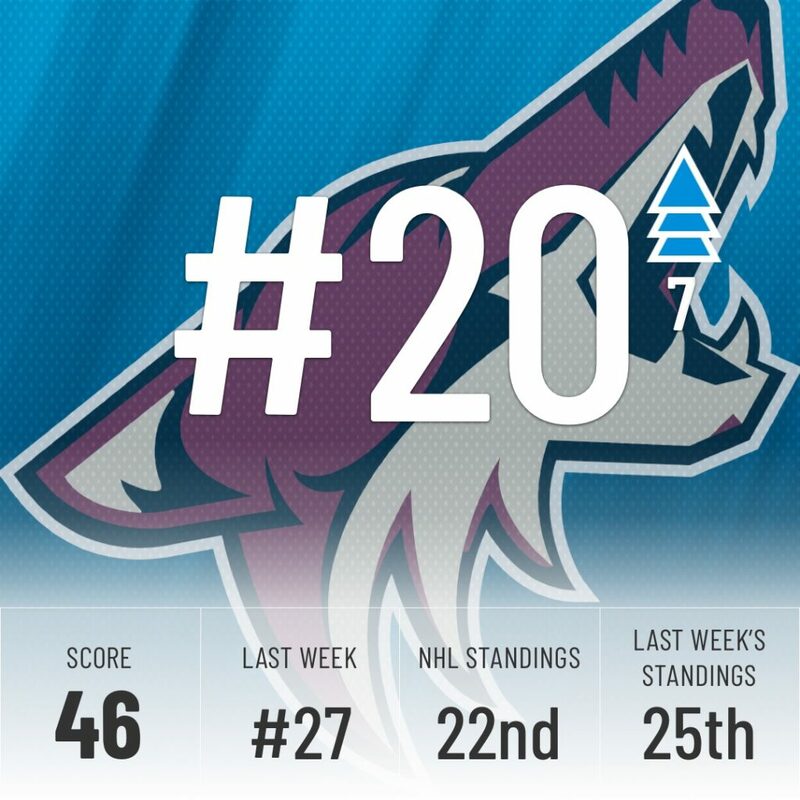 After slapping the ‘Yotes in the face last week It decided to reward their 2-1 week with a seven-spot jump in our rankings. Arizona’s been trending up recently and looks like a team that could be contending for a playoff spot by the end of the year. The Super Computer does it again! 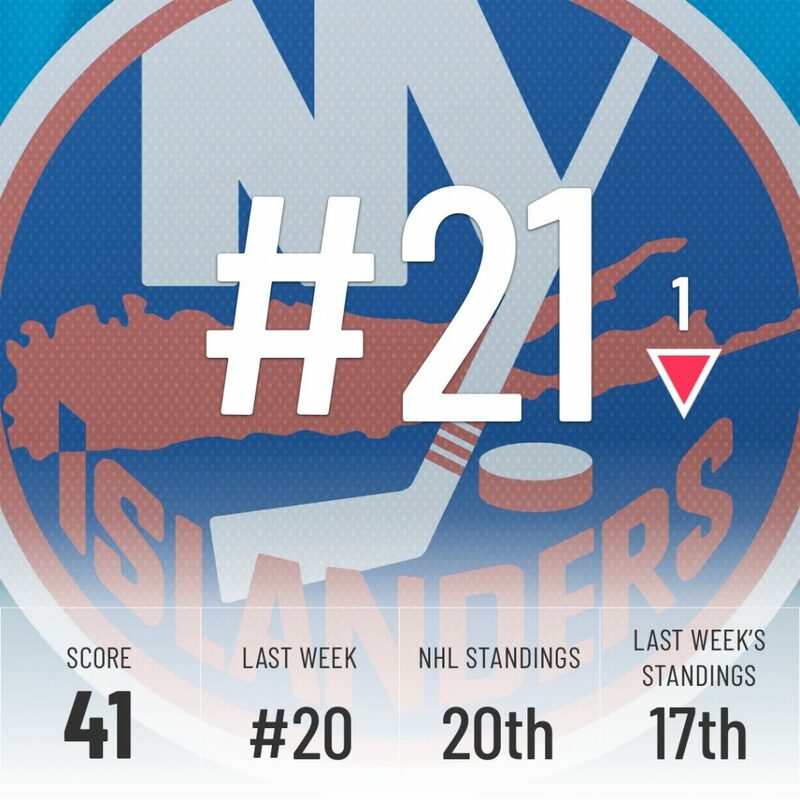 It had the Islanders ranked 20th last week and sure enough, they fell three spots in the standings to 20th. 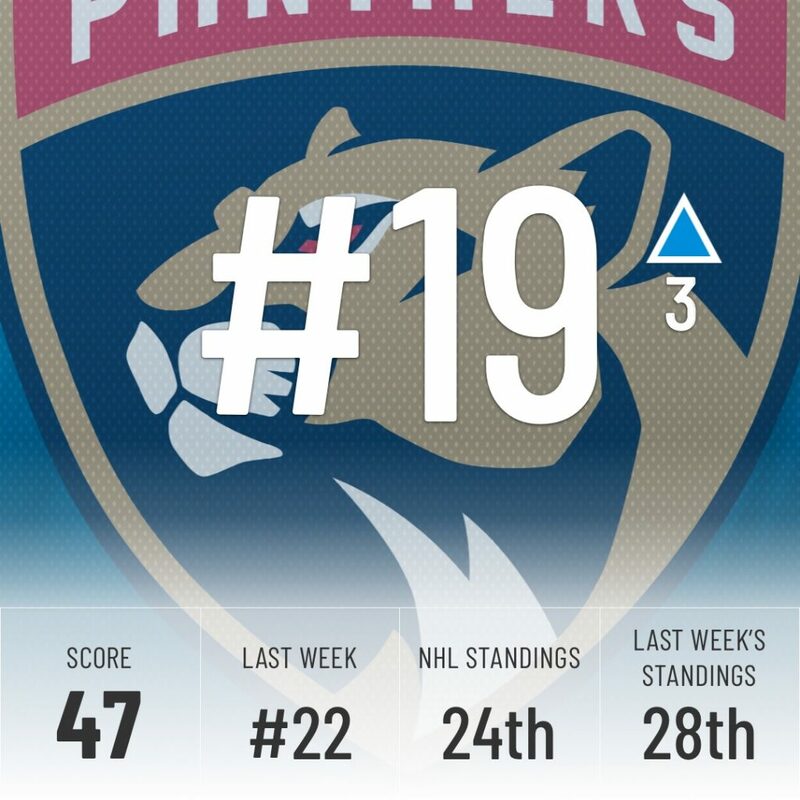 Being outscored 11-6 in three games this week has the Super Computer convinced they will continue to fall at least one more spot to 21st in our rankings. 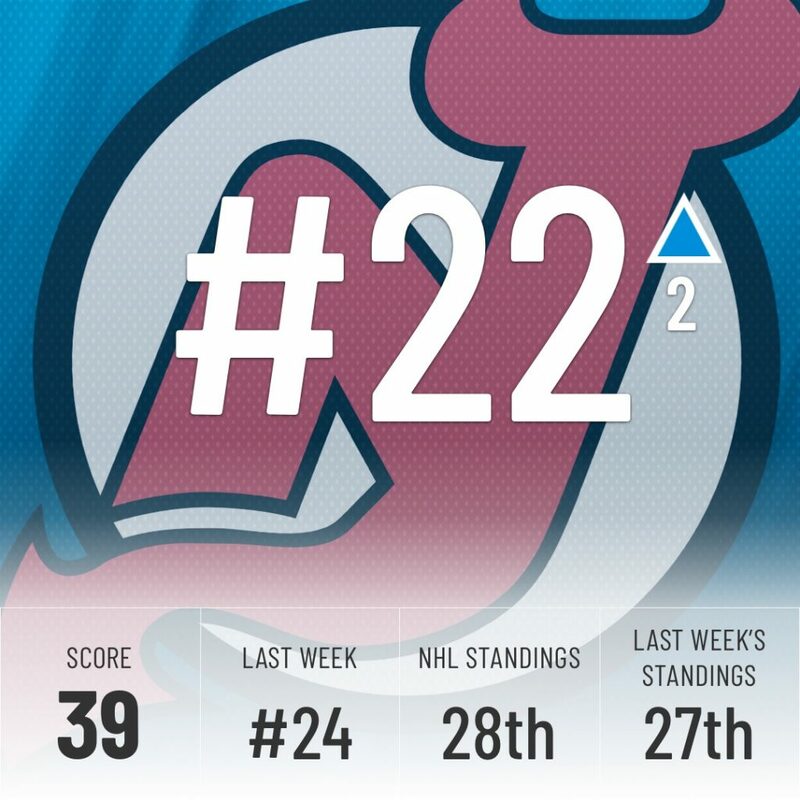 New Jersey moves back up two spots after dropping nine spots last week but it wasn’t due to them having a stellar week. Going 1-2-1 with your only win coming against the last placed Kings doesn’t exactly inspire confidence. The Devils were lucky enough that there were teams who were worse than them and that propped them up. The Rangers lost both their games this week and haven’t played since Sunday. 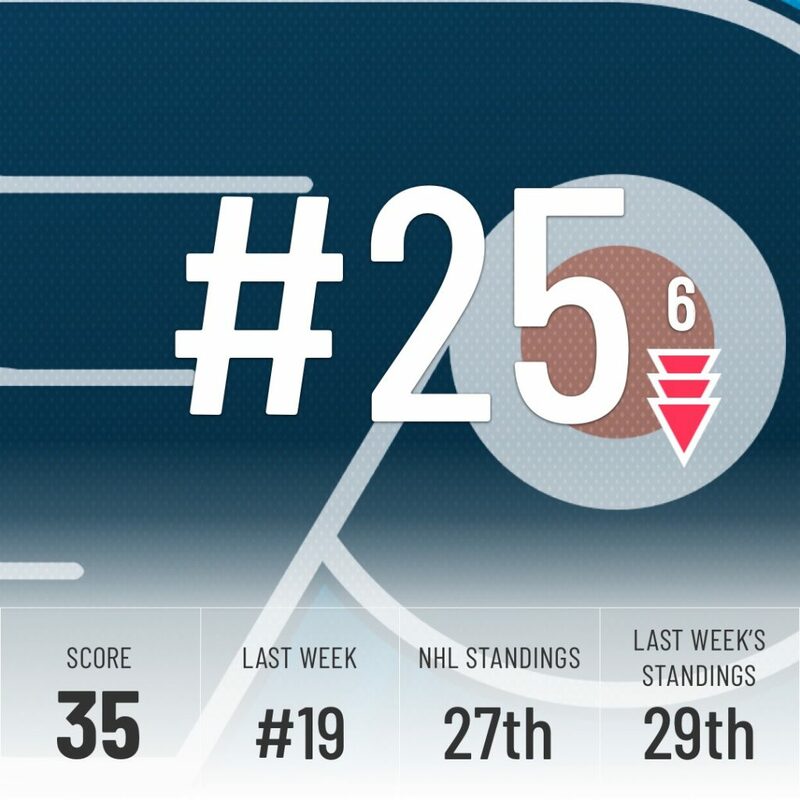 Their inactivity and two loses drops them down our rankings 6 spots. New York has another slow week coming up with a road trip through Florida against the Panthers and Lightning. If they can use the rest they’ve had to get two wins they could see themselves moving back up our rankings before long. Have the Ducks finally figured it out?! A five-game win streak has them all the way up to 2nd in the Pacific. 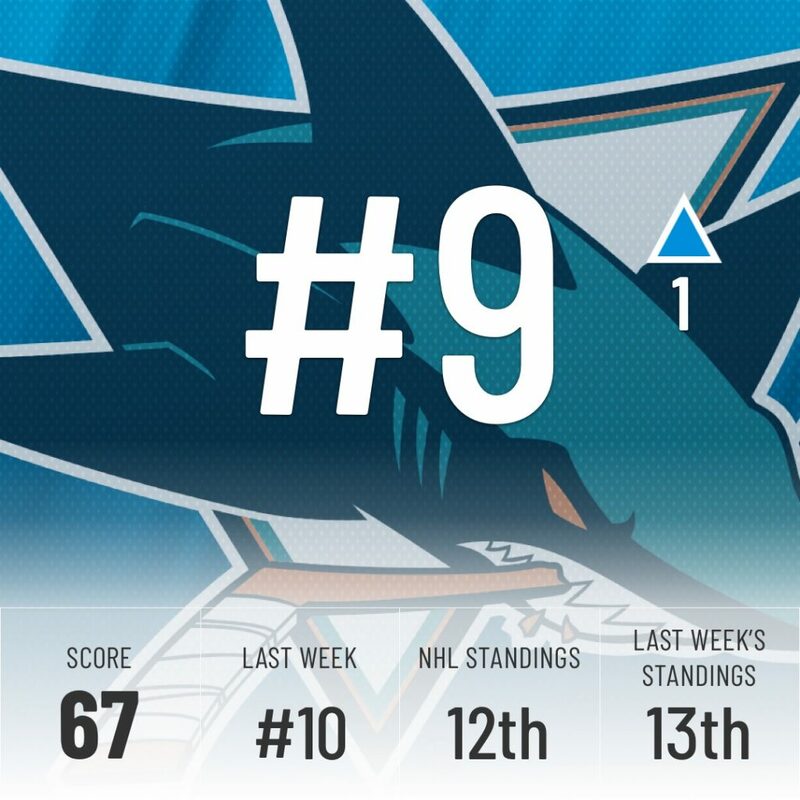 Their -11 goal differential is still a concern but they’ve shown some serious improvements in their defensive game and have the Super Computer feeling optimistic but not willing to go all-in yet – only moving Anaheim up four spots in our rankings. 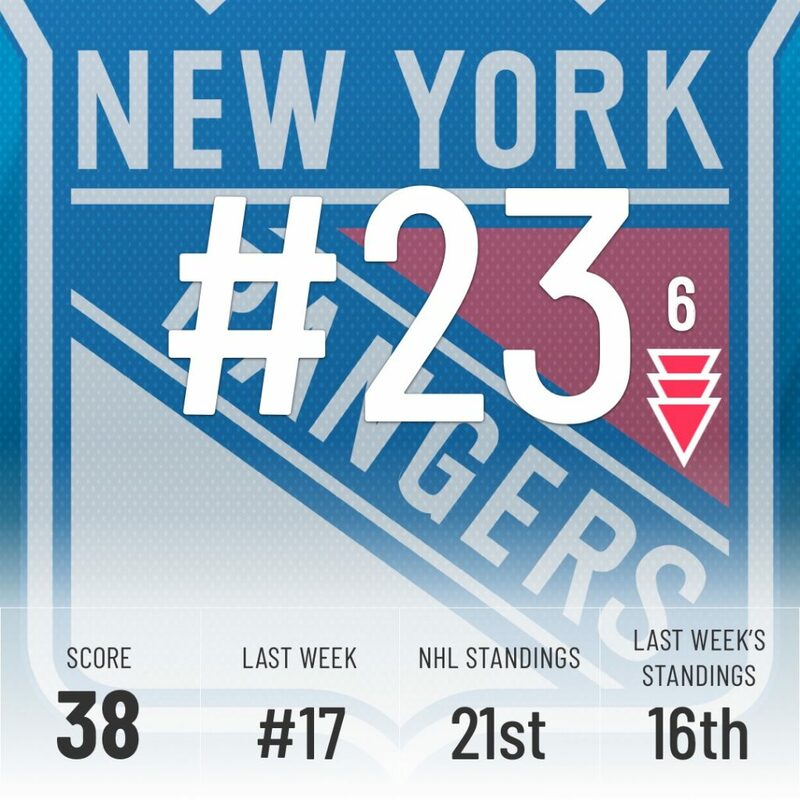 Philadelphia drops six spots in our rankings after an up-and-down week where they shutout the Rangers then followed that up by getting shutout in Toronto. The Flyers officially introduced their new GM, Chuck Fletcher, this week. Hopefully, he can find them an answer to their goaltending issues. As it stands, Flyers fans are better off keeping track of Gritty who can’t stop winning. 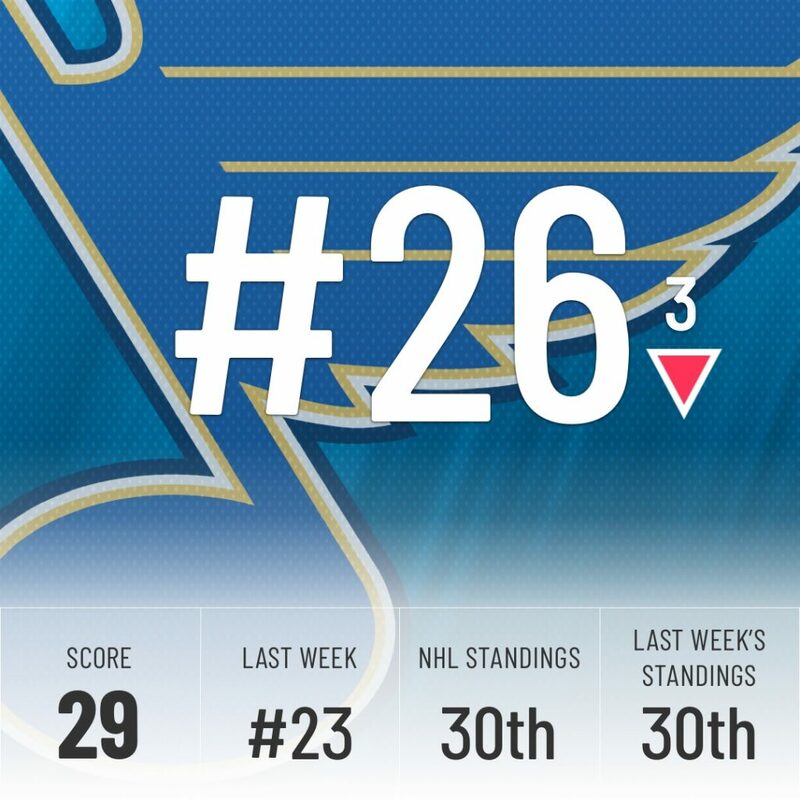 The Blues are beginning to be a conundrum and the Super Computer is starting to get fed up with them, dropping them three spots in our rankings. Just like last week, the Blues started the week off hot beating a top-five team in the Avs and then follow that up by getting thumped by the Coyotes. This type of inconsistency just won’t be enough to keep them competitive in the loaded Central division. 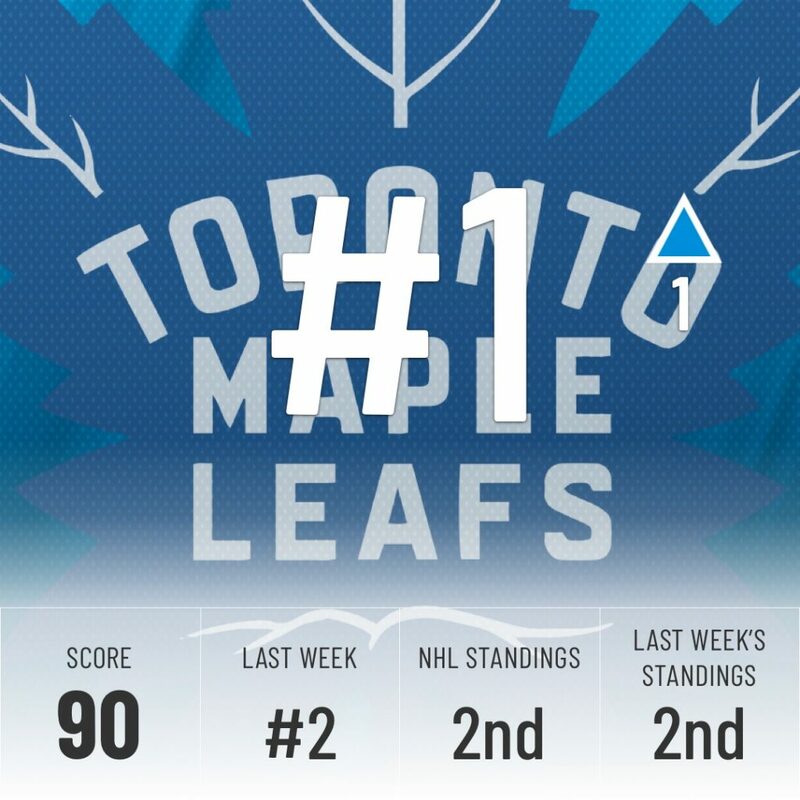 Detroit had a pretty good week going 2-1-1, which considering they played our top two ranked teams in Toronto and Tampa is even better. 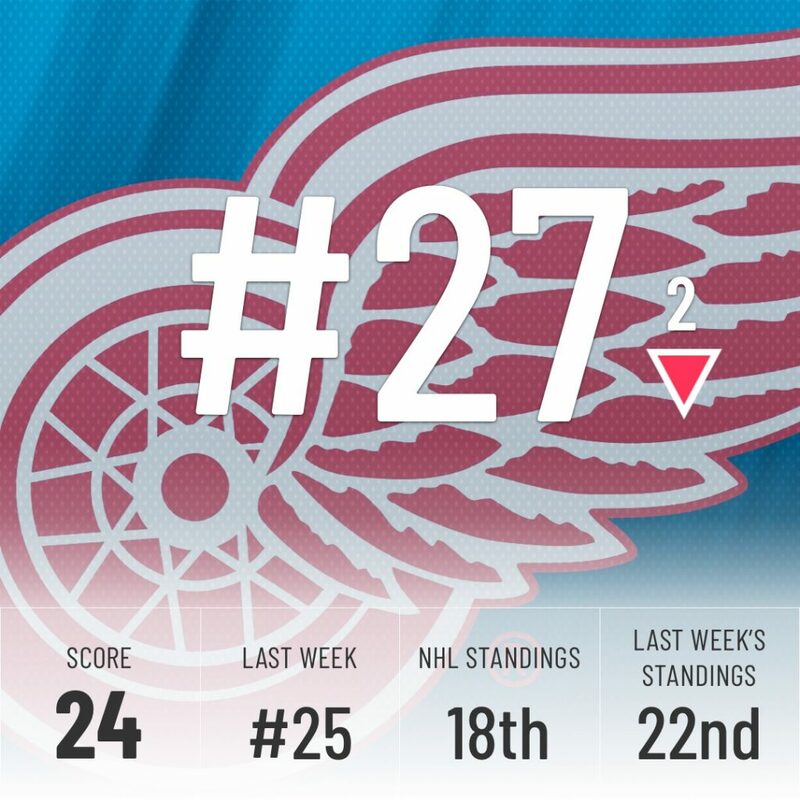 Regardless of their tough week, the Red Wings fall two spots in our rankings. Too many games going into extra time and even with two wins this week they end up with a goal differential of 0. 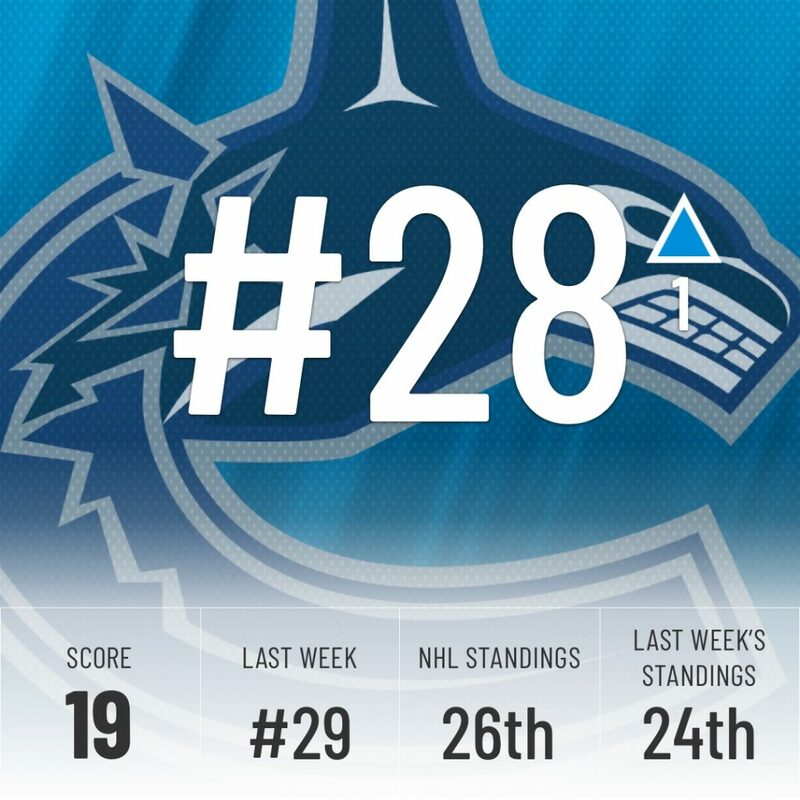 The Canucks snapped their four-game losing streak last night and move up one spot in our rankings but this team is just not ready for the big time yet. They have a lot of young pieces that are giving Canucks fans a reason to be excited about the future but that future isn’t here yet. In the meantime, here’s another incredible play by Elias Pettersson. 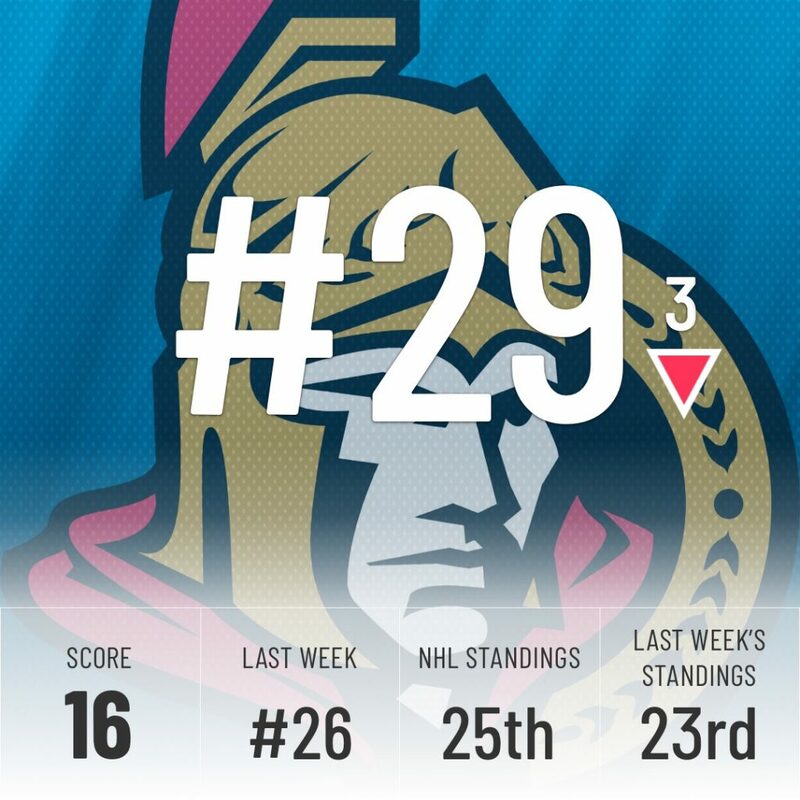 The Senators had a light schedule this week only playing 3 games but giving up 10 goals to the Canadiens in two games just highlights what we spoke about last week – their defense is a nightmare. They’re fun to watch but until they can clean that up they’ll continue to be low on our power rankings. Woah! 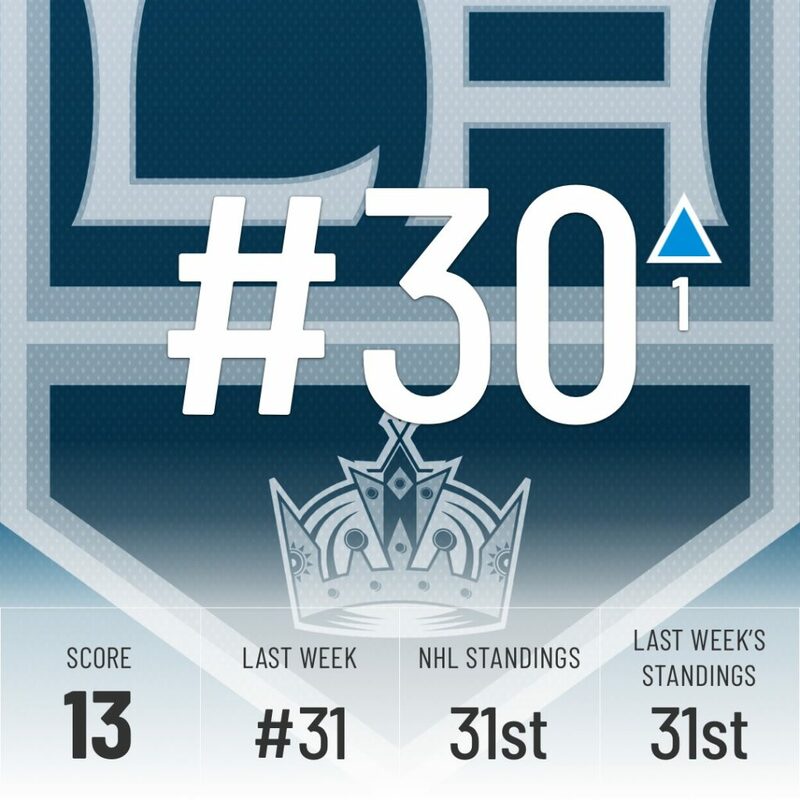 For the first time this season, the Kings are not ranked dead last in our Power Rankings. As exciting as that might be for them, they continue to occupy last in the league and the only reason we see them moving up is that the Blackhawks are doing a better job of being bad right now. 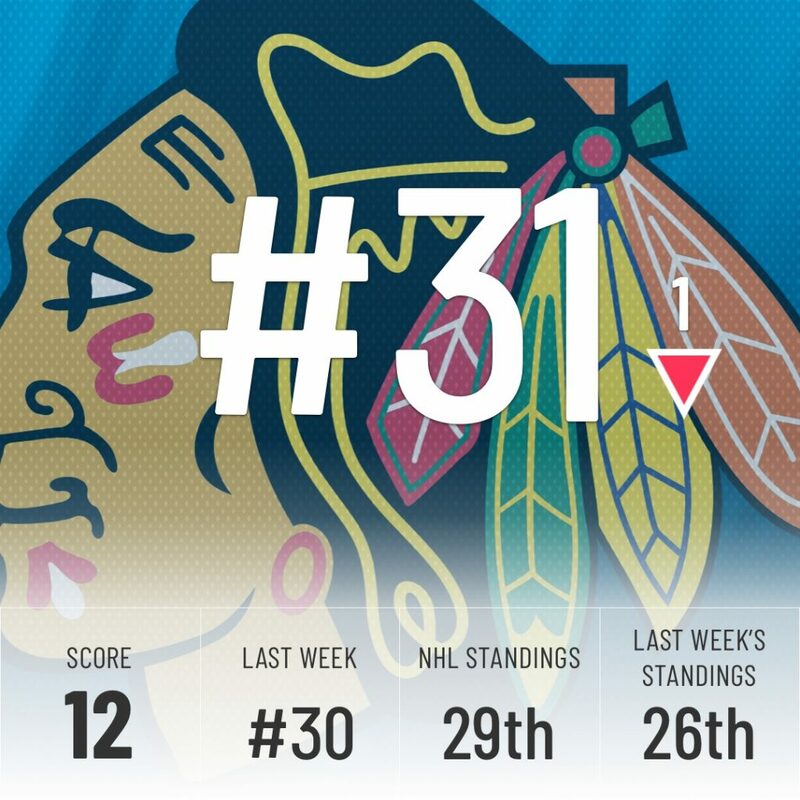 The Blackhawks followed up a bad week with an even worse week, going 0-4, dropping their goal differential to last in the league at -30. The Hawks aren’t in last yet but with the Blues and Kings having games in hand, we see them dropping to last real soon.